These Steelcase Avenir workstations measure 9′ x 8′, the panels are 65″ tall winging down to 53″ along the aisle. The panels are powered on the spine with 5 wire power. 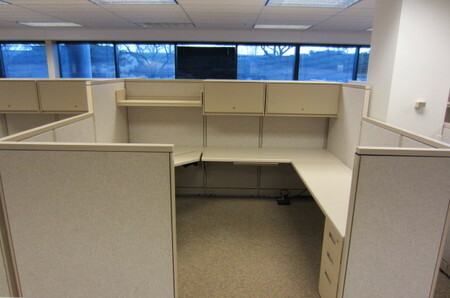 Each cubicle includes: (1) 42″ x 24″ corner worksurface with an adjustable keyboard platform, (1) 24″ x 66″ wing worksurface with a 24″ d B/B/F pedestal, (1) 54″ x 24″ wing worksurface with a 36″ two drawer lateral file, (1) 42″ 1/2 height shelf,(1) 36″ overhead bin and (1) 30″ overhead bin. The fabric on the panels is “that straw stuff” by Designtex, the paint is warm brown 1.